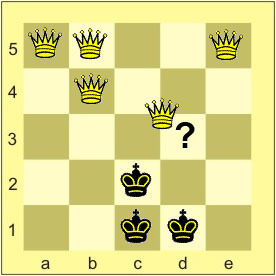 Let's begin with an easy enigma: Place five white Queens and three black Kings on a 5x5 chessboard, so that none of the Kings will be in check. 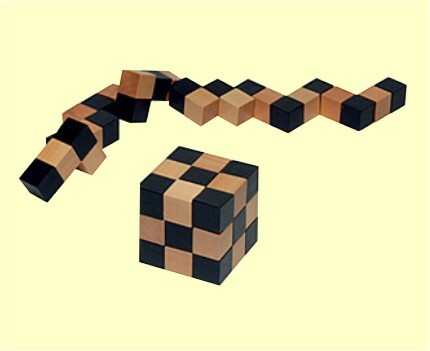 Go to the on-line version of this puzzle, as you wish, and move the pieces using your mouse. That's the challenge: You have to assemble a chessboard (8x8) using these 14 pieces. I've found 11 different solutions, so far. Will you face the challenge? Print and paste the figure on a cardboard, cut out and I wish you have a good luck! Will you face further challenges? There are twelve equal pearls, but one has a different weight (we do not know if it is more or less weighty). Determine, in three weighings, on a two plates balance scale, which of them is different and if it is more or less weighty. We have ten equal handfuls of coins. Nine of them have 10 grams coins and one has 9 grams coins. Determine in just one weighing, using a grams graduated scale, which of these handfuls has the 9 grams coins. On a small planet live blond people and at least one red haired inhabitant. All of them know that. They are intelligent, but very introspective, never talking to each other, only seeing each other. Everybody has short hair and the planet is without mirrors, meaning that nobody can see his own hair color. Every day they all assemble in central square. Until a heavenly message was received: All red haired people had to leave the planet! A non crewed spaceship would land in the square, every day, carrying off those people who, by their own judgement, have red hair. How many red haired people left the planet on sixth day, as we know the ship didn't take off empty on that day? Two square gears. Do they gear? Click on them and see. Has anyone on Planet Earth ever seen an absolutely full Moon? A hunter left his home with his vehicle pulled by animals, heading South, to search for food. He travelled for a few kilometers but found nothing. He then headed West, for another few kilometers, but to no avail. Frustrated he headed North and a few kilometers later he finally found his prey. After killing it he continued heading North, reaching his home. Which kind of animals pulled his vehicle? 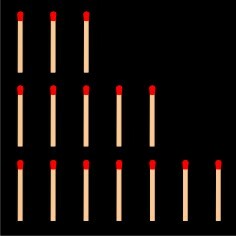 We have 15 matchsticks arranged as below. The game is played by two players. Each of them picks up one or more matchsticks, alternately, from ONE of the rows. The loser is that one who picks up the last remaining matchstick. I can ensure: the winner will be always the player who plays first, if he plays correctly. How to distribute digits 0 to 9 on two cubes, in order to display the month days, from 01 to 31?